The Greek Cypriots have an apt saying for mealtimes: “Siga, Siga!”, which translates to “Slow, slow!” Even those with the largest appetites need to heed this advice when meze dining in Cyprus. Meze, which translates to “little delicacies”, involves dish after savory dish– rich dips with breads, grilled meats, and the island’s most popular cheeses. Last night, our group met up with Katerina, a Cypriot Yalie, who brought us to one of her favorite meze dinner restaurants and expertly placed an order for our entire table. In the evenings, the Cyprus air is balmy and ideal for outdoor dining and chatter. Some of us were hungry after a long day of interviews and attacked the first round of breads and dips. What we didn’t know, however, was how much food meze involves. Some of our favorites during the eight-course meal. 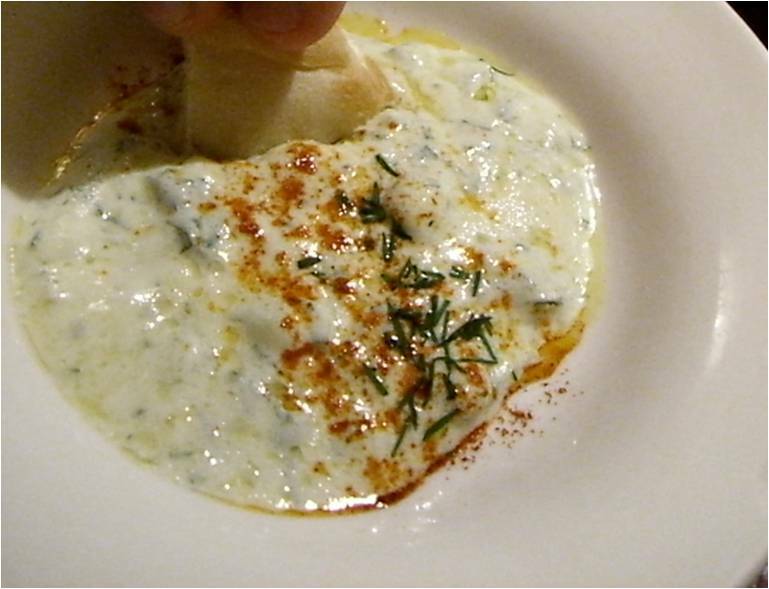 Greek Yogurt is famous worldwide, but add some cucumber and mint to make this refreshing and textured dip called Talattouri. Our waitress brought us bowls of talattouri, eggplant-based tahini, and sour cheese dip to accompany baskets of pita bread (a definite theme for this trip’s cuisine!). Yum! Halloumi are grilled cheese slices that look, upon first glance, like chicken. Halloumi is served all over the island as an appetitzer on its own, as a salad topping, or in sandwiches and wraps. 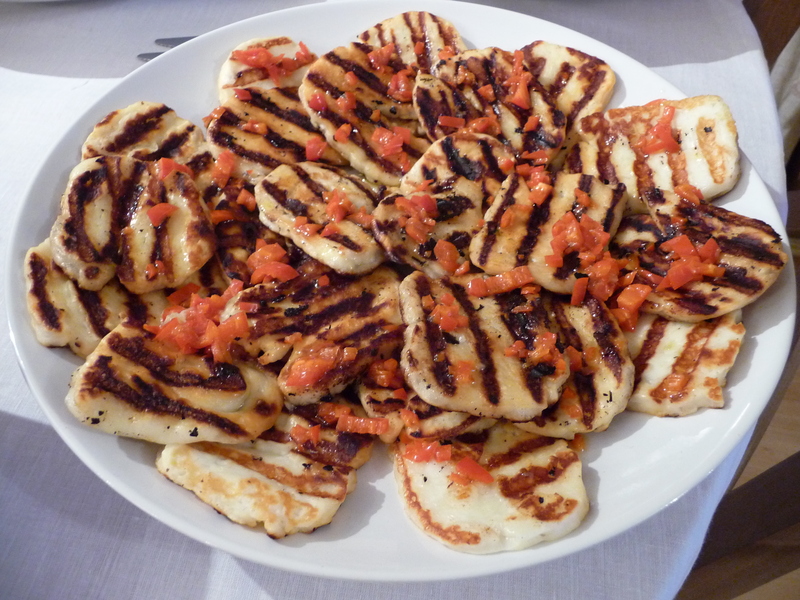 Kristos, one of Katerina’s Cypriot friends who had dinner with us, shared that halloumi is his favorite Cypriot food. Its salty taste and rubbery texture is certainly different but most palatable. We look forward to trying halloumi in other dishes. Feta, another popular type of cheese on the island, topped our Greek salads. Sheftalia are sausage-shaped meatballs made from a ground mixture of beef, pork, and spices. Souvlakia are grilled pork kebabs. Many of us remarked on the tenderness of the meat. Turns out that most Cypriots are masters at the grill! Who wouldn’t be in a place with perpetual barbeque weather? Halva is a traditional Cypriot dessert made from flour, sesame, and sugar, and oil. 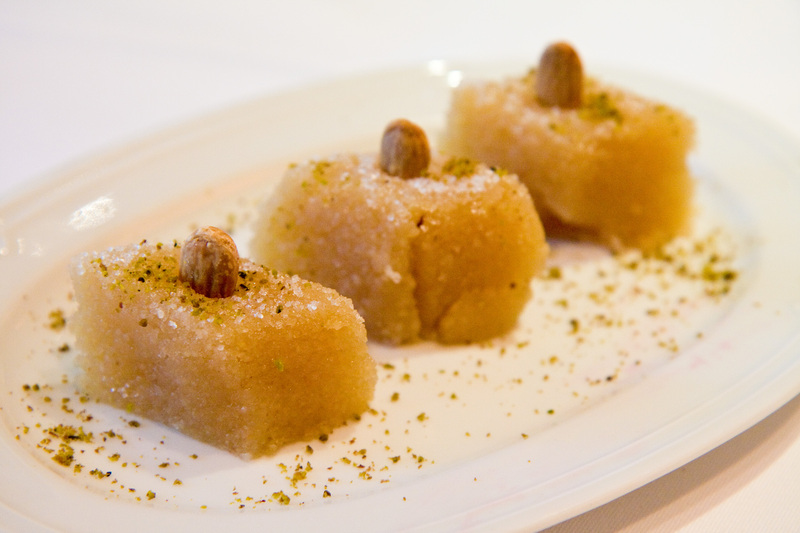 Served in small cubes, halva is incredibly, almost overwhelmingly, dense and sweet. We left the restaurant contentedly stuffed and look forward to more multi-course meze offerings in the coming days. For lunch, we’ve been exploring the ethnic offerings in Nicosia, a city teeming with multiculturalism as many migrant workers joined the community in the last decade. This entry was posted in Uncategorized and tagged cyprus, food. Bookmark the permalink.